You have heard about xAPI, and maybe even attended a few sessions about it. 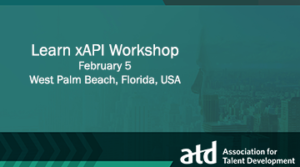 Now, you can learn how to implement xAPI in a full-day, hands-on workshop. In this workshop, we will guide you through developing your own xAPI-enabled project. The day will start with an update on the standards of xAPI. Then, we will walk through the process of developing a data strategy and planning for data analysis and visualization. You will experience working with actual data and sample projects firsthand to learn how to develop and publish xAPI-enabled content for a specific outcome. We will collect a stream of live, real-time data from your projects throughout the day! This workshop is being held in conjunction with the ATD TechKnowledge 2019 conference. There is an additional registration fee to attend the conference. This workshop will also be held as 1.5-day event in Alexandria, Virginia on March 18-19. Learn more.